What Are the 2019 Acura TLX Performance Specs? Curious about other advantages the Acura TLX has relative to the competition? Explore TLX safety features and more below! Precision All-Wheel Steering (P-AWS) – P-AWS allows the rear wheels to move 1.8 degrees, coordinating with the front wheels. This Acura-specific feature improves control around Peoria streets or down Route 51. Super Handling All-Wheel Drive (SH-AWD) – Available with the V6 TLX, SH-AWD improves handling and control on wet or dry roads. If you commute during Phoenix storms, it’s essential. 8-Speed Dual-Clutch Transmission – A dual-clutch transmission is included standard with the 4-cylinder TLX model, and it promises fast shifting and enhanced fuel economy numbers. Paddle Shifters – All TLX models include sequential SportShift steering wheel-mounted paddle shifters for a manual shifting experience with the convenience of an automatic transmission. Why Buy a High Performance Acura TLX? Visit Acura North Scottsdale to Learn More About the TLX! Learn more about the TLX by seeing how it compares to the Honda Accord. 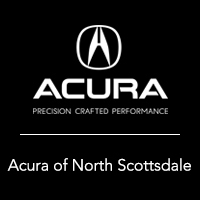 And, to experience Acura TLX performance for yourself, visit Acura North Scottsdale in Phoenix, AZ. Feel free to explore our new TLX selection online before you stop by, including the TLX with the Technology Package. Contact us if you have any questions before you schedule a test drive today!